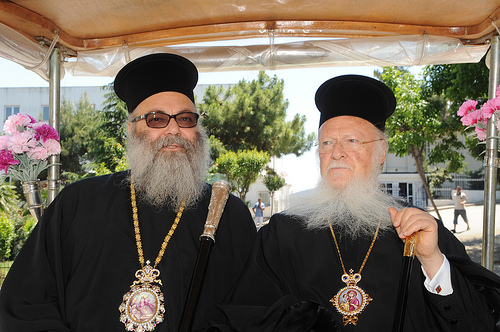 Οn Saturday, June 1, 2013, His All-Holiness Ecumenical Patriarch Bartholomew, together with members of the Holy and Sacred Synod and other Hierarchy of the Ecumenical Throne, welcomed His Beatitude Patriarch John X of Antioch to the Phanar. Patriarch John of Antioch was making his first stop in his Irenic Visitations following his election last December. Patriarch John and his entourage were received in a spirit of warm fraternal love and honor. The members of the delegation from the Church of Antioch included Metropolitans Elias of Tyre and Sidon and Saba of Bosra, Bishop Efraim of Seleucia, Frs. Silouan Oner and Michel Najim, Archdeacon Gerasimos Kabbas and Deacon Porphyrios Georgi, Dr. Elie Salem, President of Balamand University, Mr. George Nashawati, Mr. Raymond Rizk, Mr. Carol Saba and Mr. Taki Louca. His Beatitude’s three-day Irenic Visit included a pilgrimage to the Holy Theological School of Halki, a concelebration with His All-Holiness and members of the Holy and Sacred Synod in the Patriarchal Church of Saint George at the Phanar, as well as a Patriarchal service at the Church of Saints Constantine and Helen in the Consulate General of the Russian Federation in Büyükdere. Official talks took place between representatives of the Churches of Constantinople and Antioch, during which the two Patriarchs co-presided. In these meetings, members of the Ecumenical Patriarchate’s Synodal Committee on Inter-Orthodox Affairs participated along with members of the Holy Synod of the Patriarchate of Antioch. The talks were conducted in a spirit of sincere collaboration and brotherly love. Discussion focused on the hardship faced by the Orthodox Christians in the Holy See of Antioch, the necessity for accelerating the preparation of the Holy and Great Synod of the Orthodox Church, the matter of the ordination and assignment by the Patriarchate of Jerusalem of an Archbishop of Qatar, as well as issues concerning the function and role of the Episcopal Assemblies throughout the world. Click here for the Greeting by His All-Holiness on June 1, 2013. Click here for the Greeting by His All-Holiness on June 2, 2013. Click here for the Homily by His All-Holiness on June 2, 2013. Click here for the Greeting by His All-Holiness on June 3, 2013.